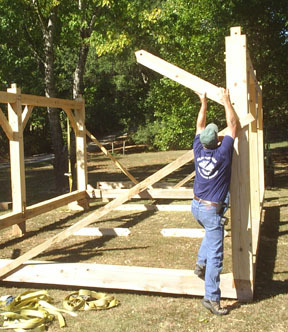 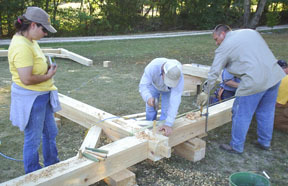 As usual, it was another great week of timber framing with another great group of fellows and 1 lady this time. 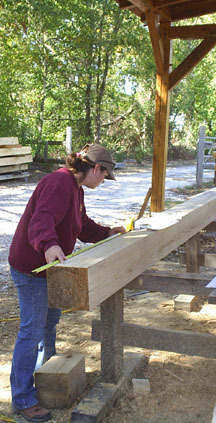 I had my second female participant in a workshop this week. 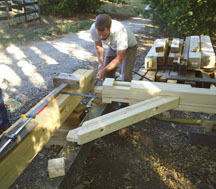 We cut a little larger timber frame and I tried some new joinery techniques for the braces. 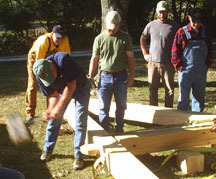 The frame came together nicely and everyone seemed content with the knowledge that had gained and left the workshop with visions of cutting their own projects. 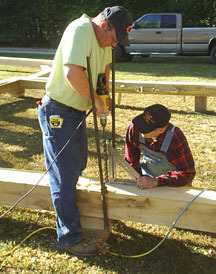 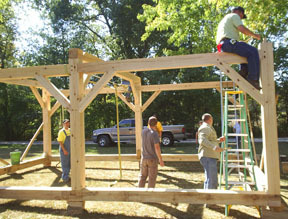 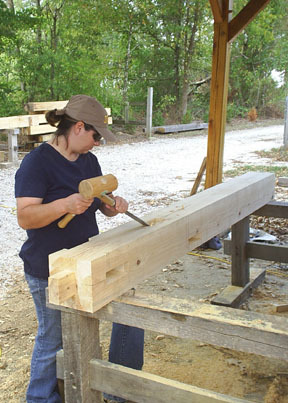 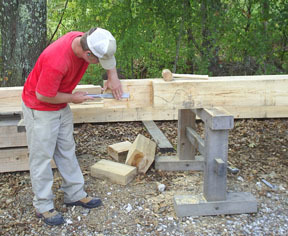 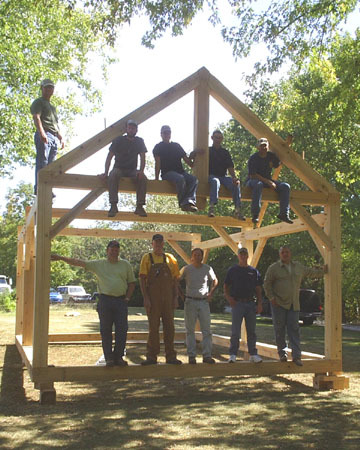 New timber framers were from Alaska, Kansas, Indiana, Tennessee, and Kentucky. 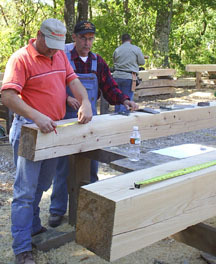 Everybody started the week learning how to read the plans and learning the layout techniques for the joinery on the timbers. 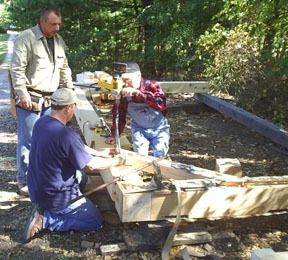 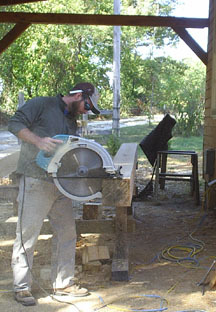 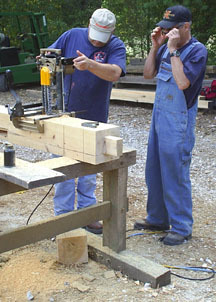 And it was not long until the participants were jumping into the project cutting joinery with the timber framing tools, 16" saw, chain mortiser, 13" planer. 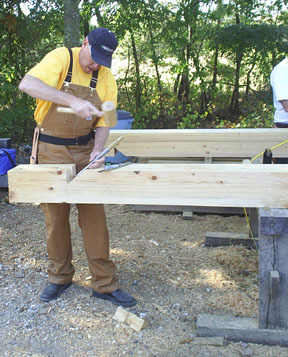 But even with the big power tools, on a hand cut timber frame there is always plenty of opportunity to use your timber framing chisel and mallet. 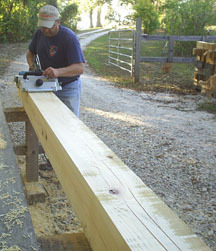 By Thursday, we have cut enough joinery that we are starting to trial fit, assemble and drill the peg holes for the timber frame. 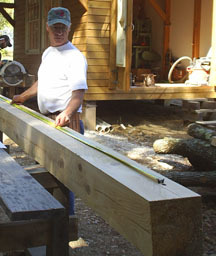 On Saturday, "Raising" Day, the group gets see the work from the week come together and on Octber 4, 2008 another batch of Grand Oaks Timber Framers take a lot of pride in what they have learned and accomplished over the past week.